Home » News and Events » Best Sports Day ever! 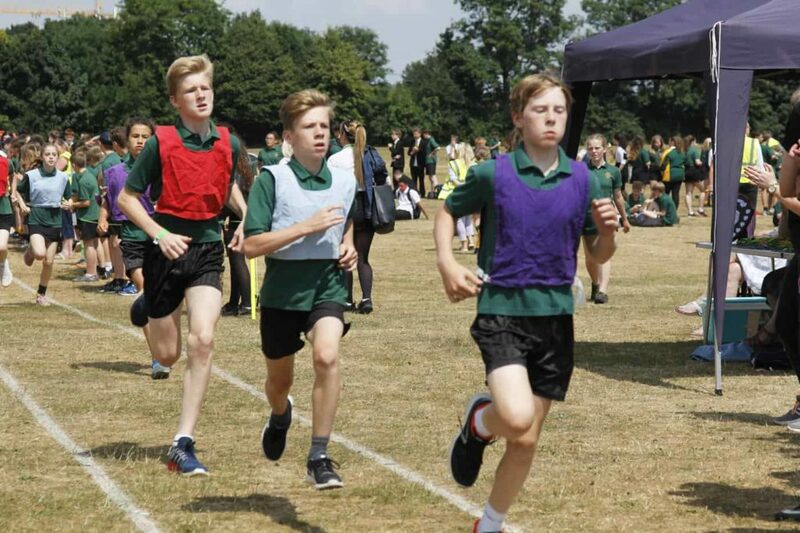 This year's Sports Day was held in hot and humid conditions not usually associated with the summer's showpiece sporting event. In a break with tradition all track and field events were held on the same day which made for an exciting buzz at school during morning registration. Students jumped and threw magnificently in the morning – so much so that no fewer than 37 records were broken before lunchtime! In the afternoon, in front of the whole school, the action continued while students watched from the middle of the track, lucky enough to be able to eat ice cream whilst cheering on their house. Going into the final event, the 4 x 100m relays, the scores were close and the trophy was still all to play for. Final scores were frantically calculated and after all the races were completed the final points separating 4th to 1st place was only 40 points. Congratulations to the winning house of Stour: captains Will Huddleston and Matilda Donaghy were delighted to receive the trophy from Mrs Fisher. Well done to all the students who represented their house this year.